R am is a magickal, musickal beast -- the measure of venus and mars at least! -- possessed of a nappy golden fleece and strung with the scraps of a beetle’s feast. 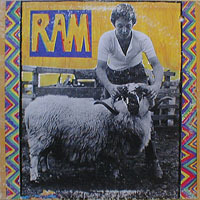 Credited to Paul and Linda McCartney, the album features supporting musicians and in many ways signals the beginning of Wings. 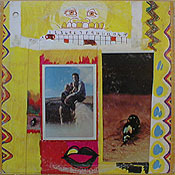 But the music itself recalls The Beatles, perhaps moreso than any other Paul McCartney album. The songs are fleshed out and scorch like little on his first album, even when the stakes are only “Smile Away”. Not that Ram reinvents the wheel -- “Ram On” parallels “Junk” as “Dear Boy” does “Teddy Boy” -- instead it adds a few more wheels and really gets rolling. 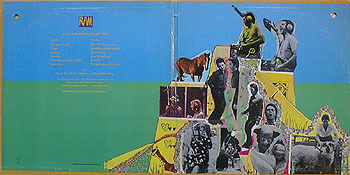 “Eat At Home,” “Too Many People,” “Heart of the Country” and “Long-Haired Lady” are a vast improvement over “Lovely Linda,” approaching what fans expected from the former Beatle in a rustic mood, while the epic “Uncle Albert/Admiral Halsey” is arguably his magnum opus (whad’r ya saving it for, “Band on the Run?”). Also tucked in at the end is a song that reached the Top 40 in the UK, “The Back Seat of My Car” (and I didn’t even know English cars had a back seat). The remaining bits are a match for McCartney’s filler, silly but with some musical sensibilities: “3 Legs,” “Monkberry Moon Delight” and “Smile Away” (which would be recycled for “Magneto and Titanium Man”). To me, this and Band on the Run best approach the quality of The Beatles. I’m not sure what Linda does on here except for harmony vocals. I remember reading somewhere that the co-credit was financially motivated, which sounds about right (we believe that we can’t be wrong).